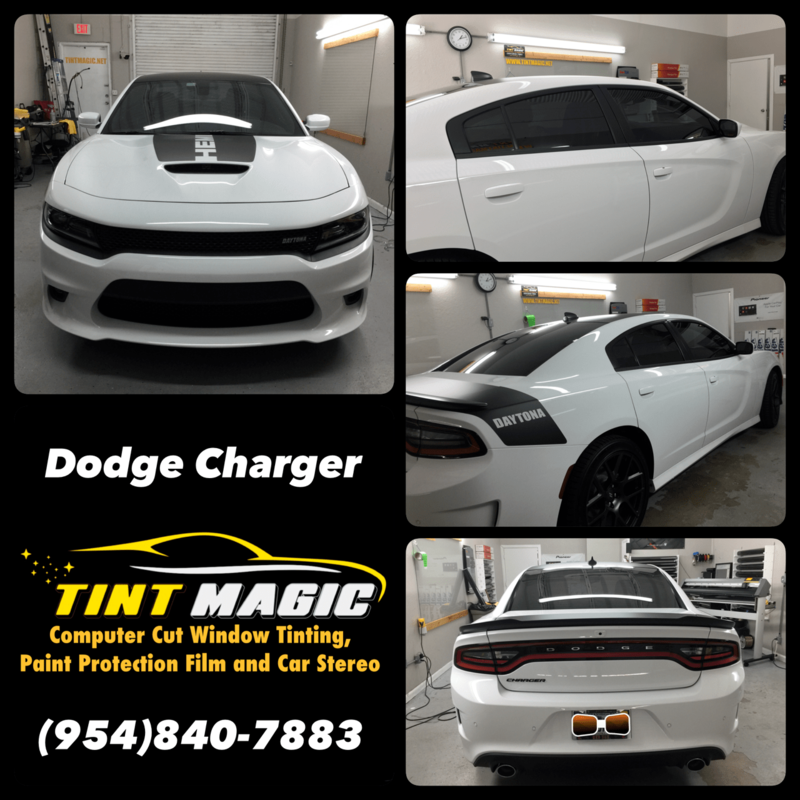 Dodge Charger window tint at Tint Magic Window Tint Coral Springs. Call us for the best quality and service! (954) 840-7883. We are located at 11344 Wiles Road, Coral Springs, Fl 33076. Tint Magic Window Tint serving: Coral Springs, Parkland, Tamarac, Coconut Creek, Boca Raton, Sunrise, Weston. A muscle car for the family, the Charger offers the style and stance to intimidate more mainstream sedans. The sport-tuned suspension and accurate steering lend a decidedly agile feel for such a big car, without compromising a compliant ride. A 292-hp 3.6-liter V-6 (300 hp with a Rallye Group package), an eight-speed automatic, and rear-wheel drive are standard; all-wheel drive is optional. Two brawnier rear-drive Hemi V-8s are also available—a 370-hp 5.7-liter or a 485-hp 6.4-liter. Despite having some Mercedes-Benz E-class bones that date back to the early part of the 21st century, the Charger is indisputably American—menacing in looks and brash in attitude. It feels substantial but manages to carry its two-ton-plus heft with respectable agility, especially when fitted with suspension and tire upgrades from its expansive options list. It also offers a decent-size trunk and a roomy cabin with ample spread-out space for families. All 2018 Charger models get a standard backup camera and rear parking assist. Similar to what it did in 2017 with the Challenger, Dodge has renamed the SXT V-6 all-wheel-drive model the Charger GT AWD, which rolls into 2018 with a 300-hp 3.6-liter V-6, 19-inch aluminum wheels, gloss-black exterior trim, and the Dodge Performance Pages accessed via the Uconnect 8.4 infotainment system. The base Charger is now the SXT, which upgrades to a standard Uconnect 4 with a 7.0-inch touchscreen plus Apple CarPlay and Android Auto compatibility. The Super Track Pack is no longer available on SXT models, but it is newly available on the SXT Plus, imparting appearance modifications (functional hood scoop, body-side cladding, and 20-inch wheels) as well as functional upgrades (three-mode stability control, a performance suspension, retuned steering, shift paddles, and stickier tires) to V-6 models.